What Do I Look for in a New Air Conditioner? My Heat Pump Isn’t Heating! Is Your Main Water Line in Trouble? Your plumbing system serves so many purposes in your home, like allowing you to shower, do laundry, and wash your dishes. A problem with your water line can affect your day-to-day life, not to mention cause serious damage to your property. There are many reasons why a water line may be compromised. Whatever the cause may be, you will want to schedule repairs as soon as possible. The two main plumbing lines connected to your home must be fully functional to keep your home safe, clean, and operational. Your main water line is responsible for providing fresh, clean water to your home while your sewer line removes wastewater. 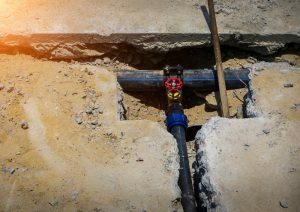 Homeowners are often unsure as to whether they are responsible for caring for their main plumbing lines or if it is the responsibility of the town’s utility workers. Here is the answer: From the point where the lines exit a home to where it crosses under the property line, the homeowner is responsible. As stated above, an issue with your water line could mean some serious damage to your home and property. Be on the lookout for these warning signs. If you experience a decrease in water pressure, it may indicate that there is an issue with your main water line. If your main water line is damaged, you’ll likely notice a drop in pressure in all the faucets around your home, not just one. A localized drop in pressure probably means that you have a leak in the supply line to that particular fixture. If your main water line is blocked or leaking, a qualified plumber needs to assess and repair the issue as quickly as possible. If the water coming out of your faucets looks discolored, it suggests that you have rust in your water supply. Often, this is due to corrosion of your main water line. When your water line is corroded, rust seeps into the water entering your home. It could also be the result of sediment in your water line that has made its way in through leaks. Because the main water line is buried under your property, any leak will cause water to seep into the dirt in your yard or to build up beneath your pavement. This cause soggy areas and puddling around your yard, and can even create cracks in your driveway. In addition, a leaky pipe can lead to the removal of dirt and create a sinkhole. If you’ve noticed you are paying more for water, you might have a leak on your hands. You might be using the same amount of water that you’ve always used, but with a leak, you are also paying for the water that is going to waste. Contacting the right plumber can help you save water and save your wallet! Leaks are a major issue. They can lead to damaged floors, walls, and furnishings. Extensive water damage eventually will lead to mildew and mold. You don’t want to let this happen. It is best to schedule a visit from a professional plumbing service if you suspect a leak. Thankfully, Snellville Heating, Air & Plumbing is a great plumber in Athens, GA! For all your plumbing needs, contact Snellville Heating, Air, & Plumbing.